The Hall was built in 1848 for $2200 near the site of the present Bemis Hall. In 1852 Lincoln’s first high school was opened on the Hall’s first floor. In the early 1870s the Hall became the site of Lincoln’s first public library. In 1884, with the present library completed and a new Town Hall (now Bemis Hall) built, the Old Town Hall was acquired from the town by James Lorin Chapin, moved downhill adjacent to the “white church” and maintained as a general store and post office for the next 27 years. In 1918 Charles Sumner Smith bought the Old Town Hall and moved it to its present site on Lincoln Road. It took several days to skid the building to its new location; throughout, its general store remained open for business. Over the following years, the Old Town Hall's tenants included a general store and gas station, a law office, a small publisher, a US post office, a real estate office and starting in 1963 a Women's Exchange selling handcrafts, gifts and antiques. In 1962, when Sumner Smith offered the building for sale, a group of concerned citizens formed a non-profit corporation to purchase and restore the Old Town Hall for the continued benefit of the town. The Lincoln Old Town Hall Corporation continues to manage and maintain this historic building to the present day, recently celebrating its 50th anniversary of service to the residents of Lincoln. 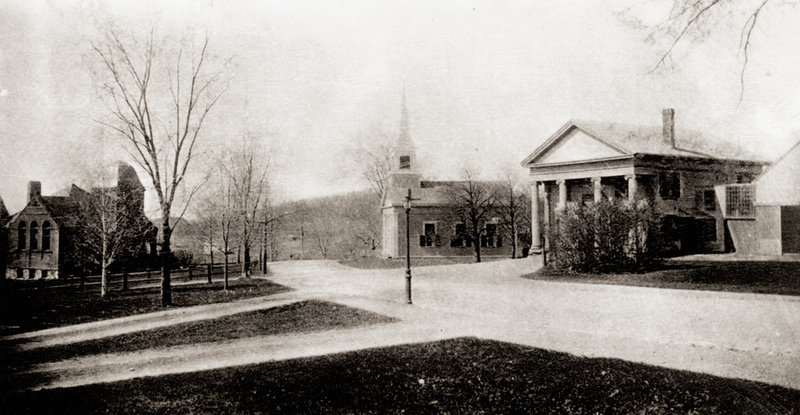 The Old Town Hall is listed in the Massachusetts and National Registers of Historic Places. As it has for generations, it continues to serve Lincoln as a gathering place, a host for local business, and a stately historic focal point. Continued stewardship of The Old Town Hall relies on charitable donations. The Old Town Hall receives no tax dollars. Please give generously to the Lincoln Old Town Hall Corporation this year so that this living piece of Lincoln’s past can stay vital and relevant into the future. In 1931, Henry Ford attempted to purchase The Lincoln Old Town Hall in order to move it piece-by-piece to his museum of significant American architecture, GreenfieldVillage, in Dearborn, Michigan. Unable to purchase our cherished building, Henry Ford was left to building a near replica of it on the museum's town green, in the company of the original Wright Brother's bicycle shop; the Logan County Courthouse where Abraham Lincoln practiced law as a young man; the homes of Noah Webster, Robert Frost, Henry Ford, William Holmes McGuffey, and H.J. Heinz; Thomas Edison's Menlo Park laboratory and complex; and the Ferris Mill--one of the oldest windmills in America, dating from 1633.